Being able to do a pull up is one of the major achievements on the fitness road. Millions of people in the world can’t do pull ups, and millions more couldn’t, but now can because of hard work and training. Don’t worry if you are one of the millions who wish they could do a pull up, but can’t. This comprehensive pull up resource will guide you through the long, tiring, and sometimes very difficult process of training to do a pull up. It doesn’t matter if you can't do pull ups! How to start? Develop a workout plan, hit the gym, and start building up to your very first repetition today! If you are completely lost when it comes to exercising, then it could be a good idea for you to consult a personal trainer or health professional, especially if you have any medical conditions or health problems. However, if you already exercise, but you just don’t know what you are doing wrong, then keep reading! It doesn’t matter how old you are, whether you are a man or a woman, how heavy you are, or what sort of job you do. You can do a pull up if you work hard enough, and I hope that this guide will inspire you to do that! To begin with I have answered some of the most common pull up questions. You may already know the answers to these, in which case you can scroll straight through to my pull up workout guide. Here I will outline the best exercises and habits to get into to build yourself up to your first pull up. To finish, I have left a few tips and tricks which I have picked up after years of experience in the fitness industry. How to do a pull up? This is a very difficult question to answer, and one which involves a very in depth discussion. For this reason, I am simply going to outline the pull up muscles used and the mechanics of a pull up. Basically, pull ups develop and strengthen all of the major pulling muscles in your upper body. Without going into too much detail, they work on your biceps, shoulder muscles, back muscles, pecs, and even your forearms to some extent. They are a great indicator of your overall fitness level – anyone who can do a pull up is clearly in good shape! The pull up movement is actually very simple (I didn’t say anything about easy! ), and I’m sure most of you already know what I mean. If you don’t, then picture this: you are hanging from a bar, and you want to lift yourself, using only your arms, so that your chin rests on top of the bar. This is basically the movement that we know as a pull up or a chin up. How to get better at pull ups? There is one simple word when it comes to getting better at pull ups: training! Strength training, weight training, even cardio training will all help you improve and will increase your chances of being able to complete a successful pull up! One great way to begin training and to get a feel for the movement is to use an assisted pullup machine. This basically reduces the amount of force that you need to use to complete a pull up – allowing you to train the movement at your level. What are the pull up exercises for improvement? Developing a pull up routine is an important part of improving your pull up strength. Any exercises which strengthen your pulling muscles – rowing, push ups, sit ups, and even things like burpees and planks are all good for improving your pull ups. I would recommend focusing on calisthenic exercises which involve using your bodyweight as a source of resistance. I say this because pull ups themselves are calisthenic movements, and it therefore makes sense to train this way. This means that you don’t really need to worry too much about using weights or going to the gym – you can actually train your pull up completely from the comfort of your living room! Pull up training is basically what you make it out to be. It can be very complex and difficult, or it can be exceedingly simple and straightforward. The only way to increase the number of pull ups you can do (or indeed, to build up to your first one), is to train, train, and train some more! If course, you can take steps to make your training easier and to facilitate your progress, such as improving your diet and trying to lose weight, but in the end, it all comes down to the type of and amount of training that you are doing. Improving your pull up technique is done in basically the same way as increasing the number of pull ups you can do. There are millions of chin up exercises out there, each of which is designed to improve your strength and technique. One useful thing to do is to use an assisted pull up machine to practice your technique. This allows you to become familiar with the movement, even if you aren’t strong enough to complete a real pull up yet. How to do pull ups at home? Fortunately, doing pull ups doesn’t require any fancy pull up machine or equipment. All you need is a bar somewhere which you can grip onto and pull yourself up on. If you have nothing around the house then you can buy simple pull up bars which hang from your door frames for not very expensive. How to build strength for pull ups? Once again, building strength for pull ups involves training, training, and a bit more training! You will pull up progression increases as you increase the amount of training that you do, and it is important to remember to train both your strength and your technique. Having a good technique will mean that you don’t actually need as much strength to complete your first pull up. Of course, strength is always a good thing, but it certainly isn’t the be all and end all of doing a pull up. How many pull ups should I do? This question has one simple answer: as many as you want to and are physically capable of doing! There is no magic number for how many pull ups a person should do at any point in their life or workout program. The number of pull ups that you should do is related to you, and to you alone. Remember this and don’t fall into the trap of comparing yourself with others! How to start doing pull ups? Titled “pull up for beginners – why can’t I do it!”. Doing pull ups requires more than a little determination and grit, especially if you haven’t regularly exercised and stayed fit in the past. Starting to do pull ups can involve a long, hard training plan which develops the necessary muscles and makes sure that you have everything you need – both technique and strength wise – to perform your first one. The key is not to expect instant results and to just keep working hard, even if you get frustrated and bored. How to do a pull up if you can't do one? Once again, train, train, and train some more. See a personal trainer to develop a workout plan, improve your diet, and one thing is certain – you will eventually be able to do your first pull up (and hopefully sooner rather than later!). How to work up to a pull up? Working up to a pull up involves training specific muscles and muscle groups. The first things that you need to do is to identify the muscles pull ups work. Once you have done this you can – either alone or in conjunction with a personal trainer – identify exercises to work on these muscles and put together a workout plan. Follow this workout plan for some time, and you will eventually be able to do a pull up. For some workout ideas take a look at my recommended workouts for building up to your first pull up! How to do more pull ups? Just keep on training! Once you have the strength that you need to do your first pull up it could be time to start developing your muscular endurance. Multiple repetitions of relatively low intensity exercises so that your muscles get used to repeat efforts. If you are a little overweight then shedding a few kilos can also help (obviously), as can improving your diet so that your body finds it easier to build muscle and make itself stronger. What muscles do I need to train for pull ups? The major pull up muscles are those in the arms, chest, shoulders, and back. You need to make sure that you train every single one of these, especially with pulling style movements. Failing to train even one of these muscle groups will greatly reduce your chance of being able to complete a pull up. The best pull up workout involves numerous exercises, all of which are designed to strengthen your pulling muscles – especially those in your back, shoulders, chest, and arms. Our favorite pull up exercises include the following five. Each of these should only be attempted when you feel confident in your abilities, and we hope that by doing them you will soon be able to complete your first pull up! This exercise is great for people with very little physical background and next to no starting strength. 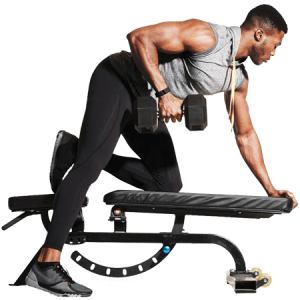 However, the fact that it uses a dumbbell means that you can simply adjust the weight to meet your capabilities! Take a dumbbell which you can comfortably lift and which doesn’t feel too heavy. Then, take one size smaller to make sure that you have the right weight (you always jump up again afterwards if it really is too light). You should ideally be able to do 3 sets of 8 reps (find a YouTube video which outlines the correct technique) with the correct weight. Once you can do this comfortably then you can move to a heavier dumbbell. The heavier you are, the heavier your target dumbbell should be, but generally somewhere between 10 and 20kg is pretty good. Complete 3 set of 8 reps every second day. Body rows are basically the pull up’s easier cousin. They work all of the same muscles and do the same thing as pull ups, but they work on an angle, which makes them easier. You can adjust the difficulty of the rows according to how strong you are. If you feel strong, then put the bar lower and your body more horizontal. If you aren’t feeling very strong then put the bar higher and your body more vertical. As a rule of thumb, you should lower the bar as soon as you can complete 3 sets of 8 reps with 2 minutes’ rest between reps.
Alternate between overhand and underhand rows to make sure that you are working all of your muscles, and continue doing other exercises to complement this one. Using an assisted pull up machine. 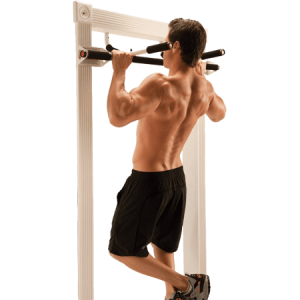 You will find that most gyms have assisted pull up machines which you can use to adjust the difficulty of your pull up until you can do it on your own. By supporting your weight with a chair, you can do some of the work with your legs, making the pull up easier. By supporting your weight with an exercise band, you can change the band you are using to make it easier or harder as needed. Assisted pull ups are as close to the real thing as you can get, and you basically need to develop them, slowly reducing the amount of assistance, until you can complete an unassisted pull up! Again, this is very similar to a real pull up, but it actually works in reverse (hence the ‘negative’). Negative pull ups involve holding onto the pull up bar, jumping until you are in the finished position, and then controlling your descent until you are hanging with your arms fully extended again. Negative pull ups are a very effective way of strengthening your muscles, but they should only be attempted when you already have a high level of strength. Note that it can be dangerous for overweight people to attempt negative pull ups as they can place a lot of strain on the joints. If you are a bit overweight then stick to assisted pull ups until you can do the real thing! Finally, the day has come. You have completed the pull up challenge, and have managed to do your first pull up! So, what now? Basically, you want to keep practicing until you can do multiple pull ups, and then until you can do multiple sets of multiple pull ups. Once you can do three sets of 10 pull ups then you can start adding weight to give yourself more resistance. The sky's the limit! Yes, pull ups are difficult, and yes it might sometimes seem like you are never going to be able to do your first one, but trust me, with enough commitment and dedication you will have your first pull up completed before you know it! The first, and perhaps the most important thing that you need to do when training for a pull up is to monitor your diet. If you are overweight then you need to try and lose weight. If not, then you simply need to stay away from fatty and highly processed foods so that your body is able to recover and strengthen itself after every training session. Back exercises are your number one priority when training for pull ups. If you have a strong back then you will be well advanced on the path to pull ups! I have only outlined a few workout ideas above. A quick internet search will yield many, many more. You will also be able to find a multitude of technical and educational videos teaching you how to do each movement properly. Remember, you don’t need a bar to do pull ups! Pull ups without a bar are absolutely possible, and can be completed by anyone at any time. Use things like tree branches, shed rafters, or anything else you can grip and pull yourself up on! There you have it: the ultimate guide to doing a pull up. While it may seem a little daunting and while you may feel like you are never going to be able to do one, I believe in you. You can do anything you set your mind to – remember this and nothing will be too hard!